These are just some of the benefits of using a whole body vibration machine. Are these benefits too good to be true? 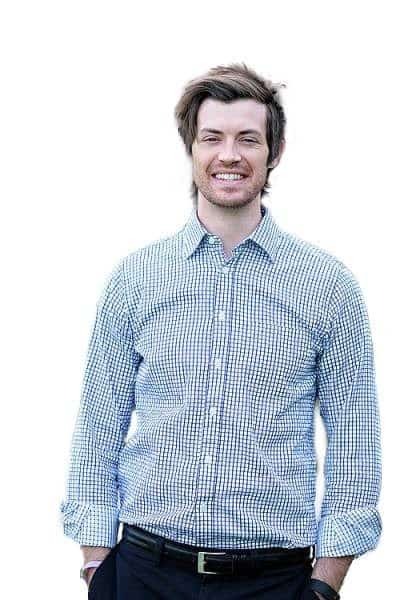 How can I get these results? Will ​it work for me? If so, which whole body vibration machine is the best? These are exactly the questions we are going to answer today. This article will give you the scientific overview including how and why I use vibration therapy in certain patients for an added boost to weight loss and other treatments. The whole body vibration machine is NOT a miracle weight loss or quick weight loss gimmick. By itself, it will most likely NOT lead to significant weight loss or improve all of your symptoms. If you are looking for a quick fix, miracle weight loss cure this is not it. Let's cut to the science here. If you look at whole body vibration from a scientific standpoint you can clearly see that there is some benefit in many areas. When any therapy improves function in multiple systems/organs/diseases we have to sit back and think about why and how it is working. In this case, we aren't really sure why vibration therapy is so effective, but I can offer some thoughts based on why this is the case. When it comes to increased muscle mass and fat loss there are several potential reasons why this type of therapy may work. Vibration causes an increase in stress on the body. Micro stress on the muscles (especially the postural muscles) may provide insight into how vibration therapy works. When your core body temperature drops several degrees your body responds by shivering. Shivering (often uncontrollably) is your body's response to the drop in energy by causing movement which produces heat. The secondary effect is the burning of calories in the process. Vibration therapy probably works through a similar mechanism. The constant vibration likely places an increased demand on the muscular tissues which translates to more work and energy in the system which causes increased calorie burn and more weight loss. The vibrations are likely working at the cellular level to some degree as well, but this idea is less understood. Does Vibration Therapy help with Weight Loss? We've already touched on this but I do want to elaborate on it further here. Specifically, I want to show how it CAN be helpful in improving weight loss. The whole body vibration machine is not a miracle weight loss therapy by itself. However, if used with exercise and proper eating it can absolutely augment your ability to lose weight faster than without using it. When using the whole body vibration with exercise (resistance training) the benefits of increased muscle mass and improved recovery post workout really start to shine. It's similar to high-intensity interval training in that less time is required for the same (if not more) benefit than traditional resistance training. The vibrations put increased demand on the muscles which can more caloric burn and faster recovery. ​Realistically if this machine is used by itself (accompanied by exercises) you will most likely notice changes to your body composition more than your actual weight. That will mean changes to your waist circumference, body fat, and muscle mass. To get the most benefit out of a whole body vibration machine the best way to use it is by doing regular ground-based exercises or weight-bearing exercises on top of the machine while it is running. 1. It causes an increased demand on the muscles working due to the vibrations. 2. It activates postural muscles increasing total work and calories burned​. The whole body vibration machine that I recommend comes with resistance training bands that strap to the bottom of the machine. This allows you to be on top of the vibration machine while using the resistance bands to take advantage of the benefits listed above. While the whole body machine I recommend is slightly different the principle is still the same. You want to be sure you are active ON the machine or at least placing PART of your body on the machine during the workout. You can do this with stretches or exercise activities. ​Most of these exercise moves are done with body weight alone, but they can be made more intense by adding dumbbells or resistance bands. ​This simple series of exercises even if done a couple of times per week will have significant benefit. Beyond the benefits of weight loss (mentioned above), whole body vibration therapy can also be used for a variety of other reasons. While not all of these practices are "evidence-based" in the sense that they have scientific studies supporting their use, I've had anecdotal success in each condition. The reason I even bring it up is that many of these medical conditions do not have therapies that work "consistently" so offering up alternative solutions is important in these instances. Because the vibration component works through mechanisms we don't fully understand it's also possible that there are many other conditions that this therapy can improve that we don't know about yet. With that in mind, I recommend a trial for various conditions if it safe for you to do so. 4. ​Will the unit be sufficient for your needs? If you want to lose weight it should have resistance bands, etc. Because each machine is unique and digging into the details can be confusing I've come up with my recommendation here. ​Having said that there are always some downsides to purchasing any product. This specific product does not produce the most force of all whole body vibration machines, which means the power is somewhat lacking. If you don't mind taking more time for results and are ok with less power then this machine would be sufficient for most people. It will work if you are interested in improving stretching and/or weight loss efforts as well. As in my experience as long as you are willing to put forth the effort (and don't expect miracle results just by standing on it) you will most likely see results. This machine (and similar kinds) are predominately used in gyms and fitness centers that focus on improving workouts and results. 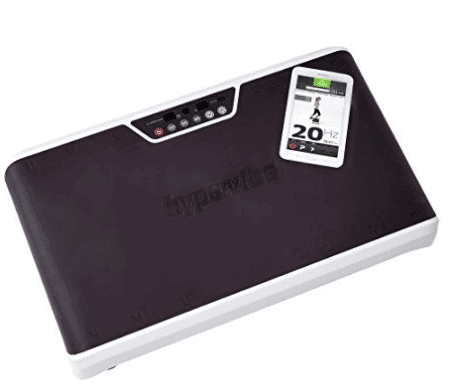 It produces more power - up to almost 10 G's of G force (indicating it has more power than most whole body vibration machines). In addition, the frequency is around 20 Hz which is the frequency used in many of the scientific studies noted above. As I mentioned before, you can still get results with less power but it will likely take more time to achieve them. 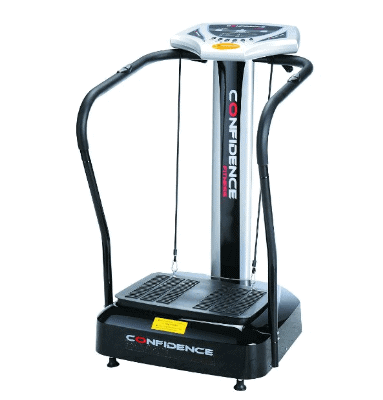 This whole body vibration machine is used in a similar way as the others but does not come with resistance bands. Lastly, it's worth pointing out that if weight loss isn't your goal, you can still get many of the benefits of whole body vibration therapy by using a supine vibration therapy machine. 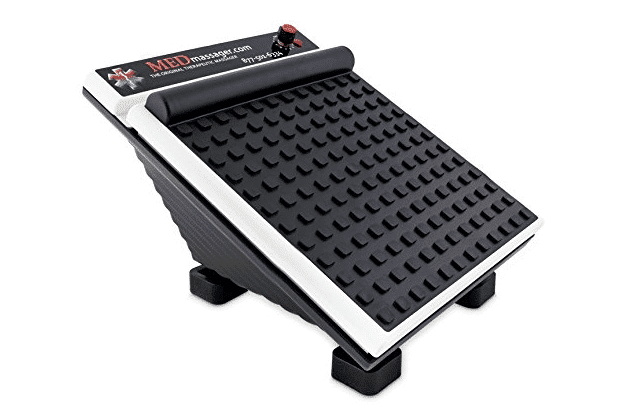 This is the model that I use for patients who have peripheral neuropathy and plantar fasciitis and differs from the whole body vibration machines in that it is targeted and designed for use in the feet. It will still send vibrations throughout the body, but will not work quite as well as the others for the WHOLE body. The advantages to this machine are that it is more portable and smaller than the other machines and is directed towards patients with medical conditions located in the feet (peripheral neuropathy, plantar fasciitis, etc.). This FAQ is based on emails I receive from patients and people who read this post. This will hopefully answer many of your questions, but realize that each machine may do something slightly different and therefore treat certain conditions better than others. Please refer to the section above if you have a specific goal. ​Vibration therapy is the concept of using an external force in the form of vibrations through the body. This increase in force has benefits on circulation, bone health, and skeletal muscles. It was originally created and used in astronauts to prevent bone loss while in space due to the lack of gravitational force. Whole body vibration therapy refers to vibrations that are felt and emitted throughout the entire body. The greater the force of the vibration (G force and frequency) the farther the force will translate through the body. Whole body vibration has a variety of benefits on multiple medical conditions due to the external force of energy put into the body. Will whole body vibration improve my balance? Several studies have shown that whole body vibration therapy may improve balance. Studies have shown improvement in patients who have suffered decreased mobility and balance after stroke (9), in patients with Parkinson's disease (10) and in others with diabetic neuropathy (11). ​Studies show various degrees of improvement and the benefit will likely depend on the CAUSE of your balance and gait issues. For instance, if you have a vitamin B12 deficiency contributing to your peripheral neuropathy/balance issues then using whole body vibration is not likely to help considerably because it won't magically fix your B12 problem. Will Whole body vibration improve my peripheral neuropathy? It might help your peripheral neuropathy (12). Studies have shown that some patients who have chemotherapy-induced peripheral neuropathy and type II diabetes induced peripheral neuropathy may get benefit from using whole body vibration. For maximum benefit use whole body vibration therapy as part of a larger treatment plan that includes lifestyle changes, anti-inflammatory agents and other medications/supplements that improve blood flow. Part of the reason that vibration therapy is felt to help peripheral neuropathy due to type II diabetes is that the damage from this condition occurs as a result of decreased blood flow due to microvascular disease. ​Is Whole body vibration therapy good for seniors and the elderly? I have found that many patients (seniors or elderly included) who are unable to tolerate more intense exercises may benefit tremendously from using whole body vibration therapy. The addition of force on the joints, plus the added benefit of postural contraction may help to improve balance which can lead to reduced falls and complications of falls. The benefit of using whole body vibration therapy is that many patients who are unable to get up and exercise can still find benefit while stretching on the machine itself. Whole body vibration therapy has multiple benefits and many scientific studies showing benefit. Having said that it is not a miracle machine and may NOT help your medical condition. Those who obtain the most benefit while using this machine use it properly and use it as part of a larger treatment plan. If you are seeking weight loss benefits then I recommend using this machine. If you are seeking a well-rounded vibration machine for better health then I recommend this machine. If you are looking to treat peripheral neuropathy or plantar fasciitis then I recommend this machine. Have you used whole body vibration before? Did it help? Why or why not? Fasting for Weight Loss: Does it Actually Work?